You soon realise that comfortable dress shoes are of vital importance if you’re standing all day or spend most of your time in formal environments. At Bespoke Unit, we often wear dress shoes so we’re more than aware of this! Interested in a particular pair? Just click on the link above to jump right to it! Otherwise, scroll down to see them all. At the end of this guide, we’ll also detail what to look for in dress shoes so that they’re comfortable. In a rush and want to jump straight to the shoes? Just use our Quick Buy Guide below to pick up a pair! However, you can learn their individual details by scrolling down. What Are The Most Comfortable Dress Shoes For Men? How Can Dress Shoes Be Comfortable? Wolf & Shepherd are a premium footwear brand whose claim to fame was creating a classic dress shoe that is exceedingly comfortable. With a construction inspired by athletic footwear, these shoes offer features such as EVA footbeds and supportive midsoles. Whatever formal needs you may have, the Closer Cap Toe is a shoe style that can accommodate a whole range of dress codes. WHether your needs are the office, formal gatherings or lavish cocktail soirées, these will blend right in. For more casual dress, there’s also the option to opt for “maple” mid-brown or “honey” tan leathers. However, if you’re looking for a formal dress shoe, black is always a solid choice. Whilst these are classic Oxfords like the pair above, they’re not only more affordable but are made using more traditional methods. Handmade from Argentinian calfskin, they offer excellent quality given the price point. 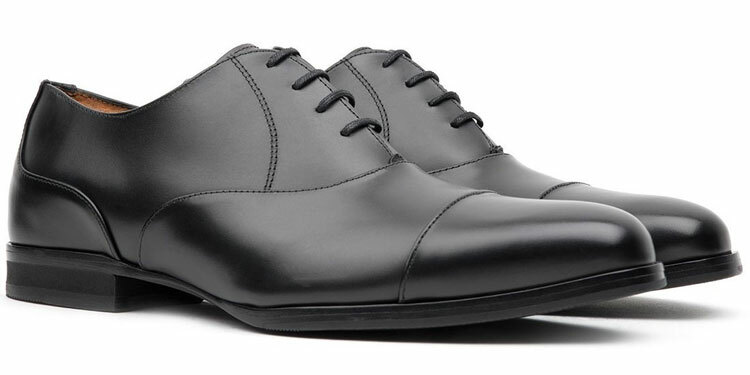 Ideal for business and professional wear, these sleek Oxfords can also be worn for more formal occasions too. These are an excellent choice for everyday professional wear. If you’re looking for a more casual shoe, then brown is a very good option. However, black leather is always the best choice when seeking to cater to formal requirements. An alternative to Wolf & Shepherd’s Close Cap Toe is the Senna Wingtip. If you’re looking for a flashier shoe style that offers the details of a brogue without becoming too informal, these are a beautiful specimen. Known as blind brogues, these feature the same details as a brogue save for the medallion on the toe cap. This makes them a more streamlined style, which is slightly more formal than full brogues. 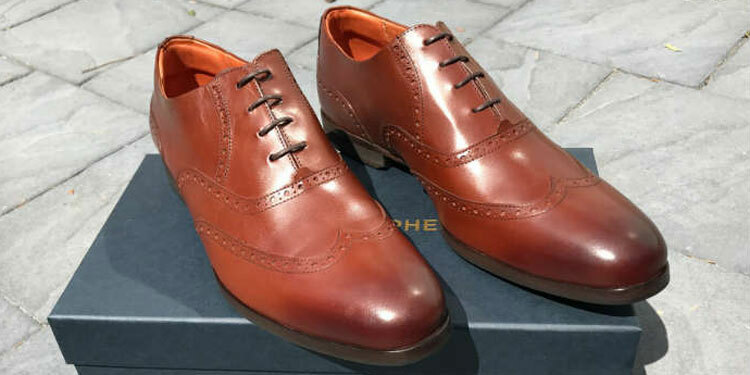 Like the Oxfords, these brogues are available in a maple mid-brown or honey tan. However, if you want to go for a more formal style, they’d also look great in black, which is rare for brogues. 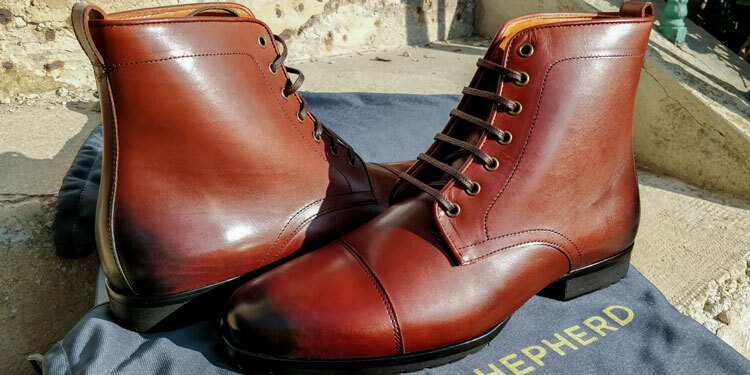 As comfortable boots go, the Breakaway boots by Wolf & Shepherd are hard to beat. Between the memory foam footbed, EVA heel and lightweight construction, they’re well-made for ensuring all-day comfort no matter the punishment that they take. Furthermore, they’re very versatile. These boots can be worn both formally on business or even as casual footwear. Overall, whether you’re wearing suits or jeans, they look great. For a more formal boot, consider the black Onyx calfskin. Meanwhile the cognic while be a versatile choice and the honey tan would be the most casual. With the Dianite soles that offer comfort return when walking, Allen Edmonds have created and beautifully stylish and elegant brogue. Similarly, a cushioned insole makes these very comfortable indeed. 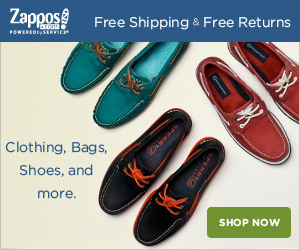 Although more casual as the options above, we still find these to be fantastic dress shoes. If you’re fond of tweeds, then they’re perfect for this sort of formal wear. Meanwhile, they’re fantastic as business casual footwear as they look wonderful with chinos and a sport jacket. Unfortunately, these are only available in brown so you can’t wear them more formally. However, the shade of brown offered is stunning. It has an aged vintage look, which looks great when worn. There’s also a touch of tan in the welt as well as rust red Dianite soles. Although not strictly a dress shoe, the penny loafer is a very comfortable footwear style for less formal attire. With its EVA footbed and subtle orthotic design, Mephisto have made a very cosy shoe. As mentioned above, these aren’t particularly formal shoes and at the very limit of dressiness. Therefore, it’ll be hard to wear these with a suit unless it’s the summertime. On this occasion, it’s a great option to pair with a beige suit. Whilst we quite like the laid-back attitude of the tan loafers, they’re also available in a Cordovan shade, which is equally if not more elegant. However, we’d refrain from the black leather as it’s slightly too dressy for the shoe style. 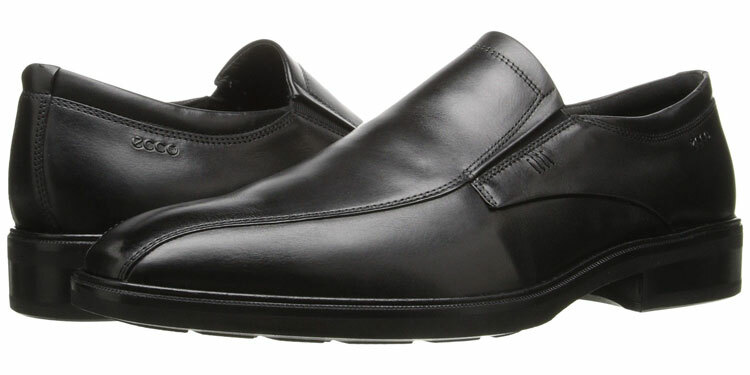 With the ECCO Comfort fibre system and a removable leather covered inlay sole, these loafers are very comfortable to wear. If you’re looking for an understated and subtle dress shoe, they’re an excellent solution. These are best reserved for professional wear where you’re on your feet all day yet requires a relatively formal shoe. However, they’re not necessarily the best choice for formal occasions where you want to look stylish. If you want something a little more casual, you can opt for the walnut brown, which is somewhat more stylish. However, if you’re looking for a more formal look for work or other occasions, black is the way to go. Like Vionic, Rockport is well-known for making orthotic shoes that don’t look too clinical. Their approach is quite similar and these shoes also feature an EVA footbed that offers both stability and cushioning for a comfortable and corrected gait. We think these are great for business professional wear with a classic-cut suit. However, you could probably push it all the way up to cocktail attire as they’re really rather stylish for orthotic shoes! 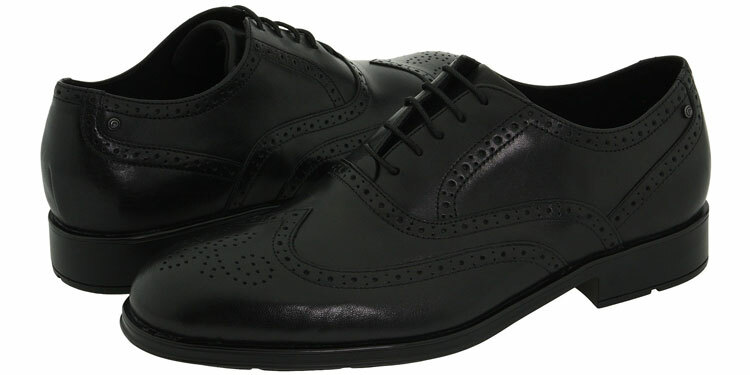 Currently, these brogues are only available in black, which is ideal for more formal wear. 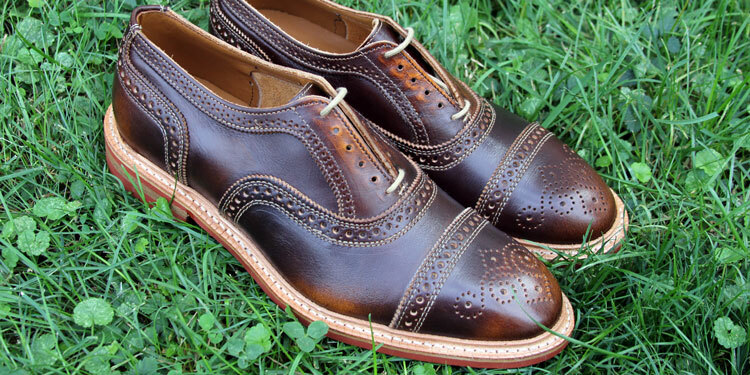 If you’re looking for brown brogues, we’d recommend the Allen Edmonds Strandmok above. 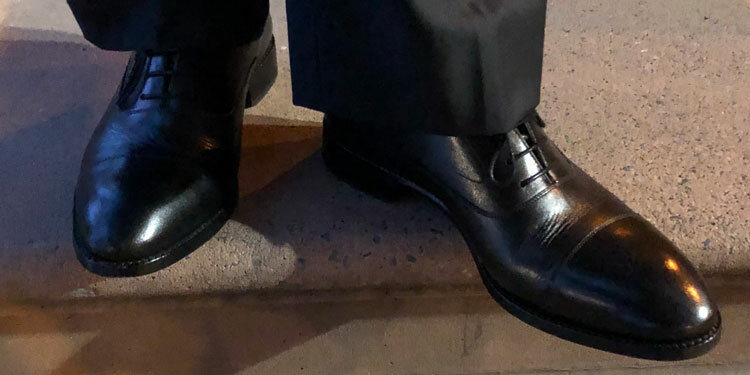 When people mention dress shoes, the first image that comes to mind is sluggish footwear that’s stiff and causes blisters. However, we’ve come a long way from the wood and leather apparatus from centuries ago. Since most of us still wear harmful footwear, we’re at risk of ailments such as Plantar Fasciitis or overpronation. Yet thanks to the advances in dress shoes, you can now wear formal footwear a particular dress code that’s just as comfortable as running shoes! In this section, we’ll explore the features to look for in formal footwear that can ensure all-day comfort. 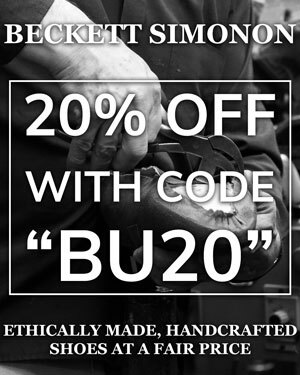 Firstly, we can’t stress how important it is to make sure that your shoes fit properly. You can start by properly learning the size of your feet as most people actually don’t know their real size. Read up on how a shoe should fit to see if you run into any problems with your usual footwear. Similarly, you should become familiar with the shape of your feet. After experimenting, you may notice that not all shoes fit your feet perfectly due to differences in lasts. Furthermore, people may have different arch heights in their feet. It’s important to be aware of you arches as this can drastically affect the comfort of your shoes. You can learn more about this with our dedicated arch support guide. Breathable Materials: Leather and some synthetics let you feet breathe, which reduces perspiration and prevents blistering. Arch Support: As mentioned above, you’ll need to have the right arch support to accommodate for yours and ensure all-day comfort. Too much can cause bruising whilst too little results in overpronation. 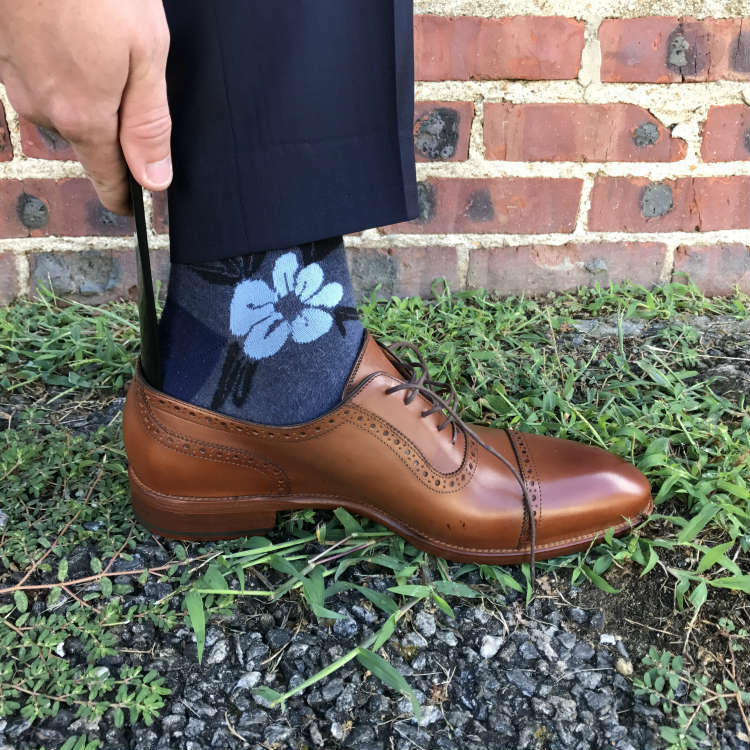 Cushioning: A trait of athletic footwear that’s being seen more and more in dress shoes, cushioning secures the feet and reduces pressure on its contours. Stability: Too much cushion can reduce stability and affect your gait. Therefore, a careful balance will ensure you walk correctly and avoid any ankle discomfort. Ankle Grip: Features such as ankle notches or collars will ensure that the foot sits securely in the shoe. This reduces rubbing and prevents the development of blisters. Reviewed by Jeremy C., on June 16th . "Comfortable without cutting on style. I still look great without killing my feet!" Thank you for the comment, and we’re glad you found it helpful.